New from Hohner is this superb high quality harp rack unlike any other. 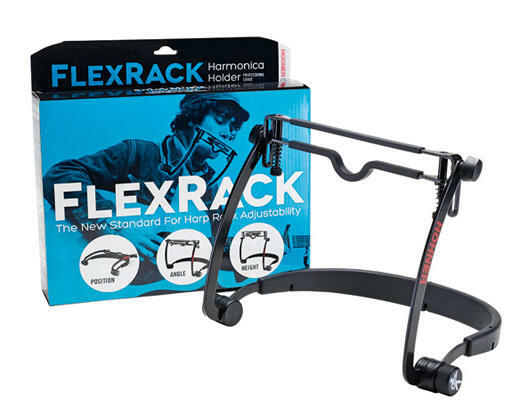 The Flexrack harp harness is a long awaited addition to Hohner's accessory range. Most harnesses on the market have only one adjustment, pivoting forward and back, not allowing for different neck sizes and physiques, which can cause neck strain. The Flexrack - a masterpiece in design and function, great harmonica gift idea, especialy for a Bob Dylan fan. Suitable for diatonic harmonicas and tremolo harmonicas.